Multi-Touch RGB Controller for RGB LED Strip Lights. This touch sensitive remote controller will allow the use to scroll through colours seamlessly with the colour wheel. 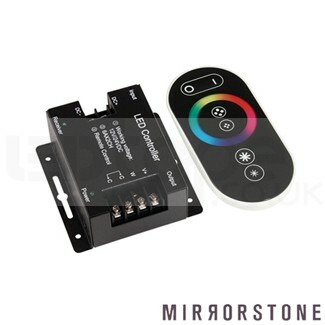 This amazing controller is a radio frequency controlled touch sensitive remote system to be used in conjunction with any of our RGB LED Strip Lights. Instructions provided inside the box with the item including connection diagrams and detailed specs. This product has a 20m range and is rado frequency, NOT infra-red.